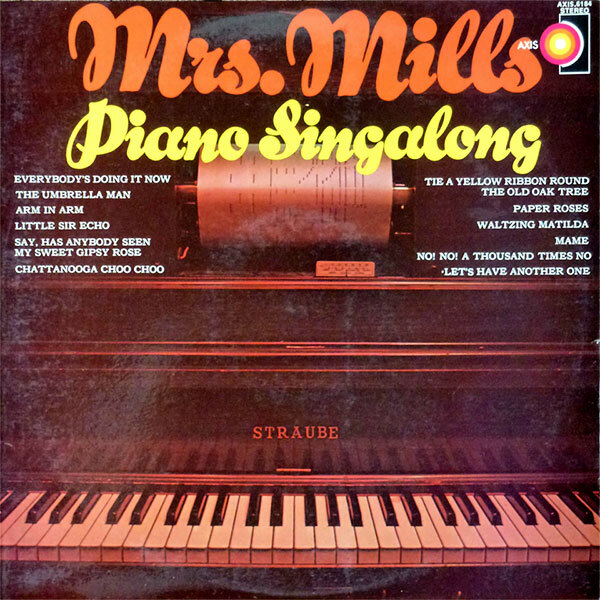 Mrs Mills knocked our singles, EPs and albums like there was no tomorrow, releasing 18 singles and 25 albums on EMI/Parlophone, with further releases and re-releases on EMI/Music For Pleasure and various other labels. There's too many to list here, but you can see a comprehensive listing of all her releases on her Wikipedia page and MusicStack. 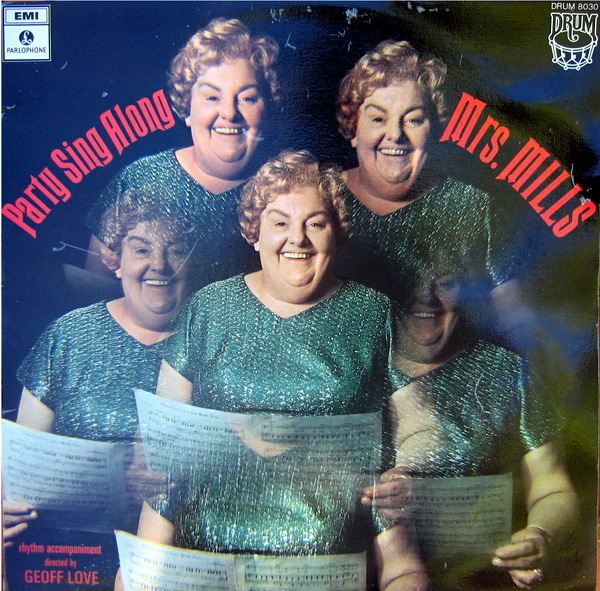 Mrs Gladys Mills was remembered for her sense of fun, and her album covers were rarely serious affairs, as this collection testifies. We're slowly compiling a collection of all her work via eBay and other sources, and will be posting up higher quality photos of her sleeves over time. 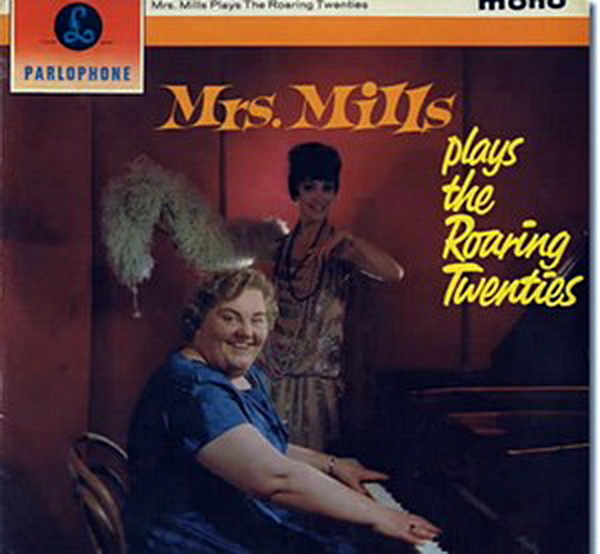 'Mrs Mills Plays The Roaring Twenties' from 1962. 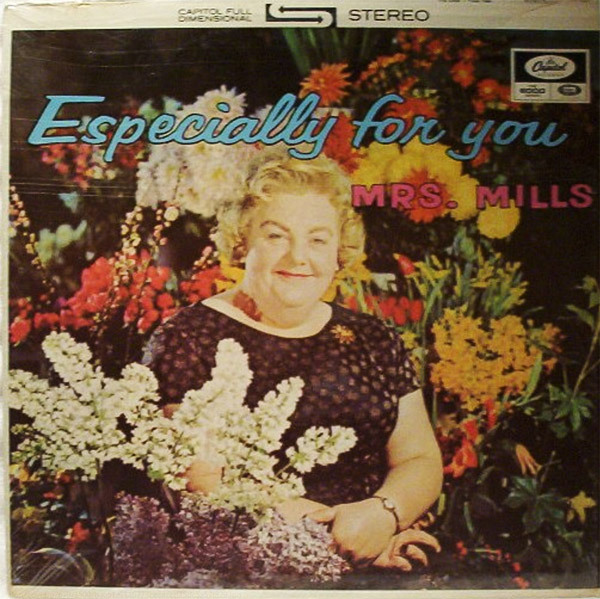 Airbrushing a-plenty for 'Everyone's Welcome at Mrs Mills' Party,' an early November 1963 release, with the sleeve featuring a different background pasted in behind Gladys. 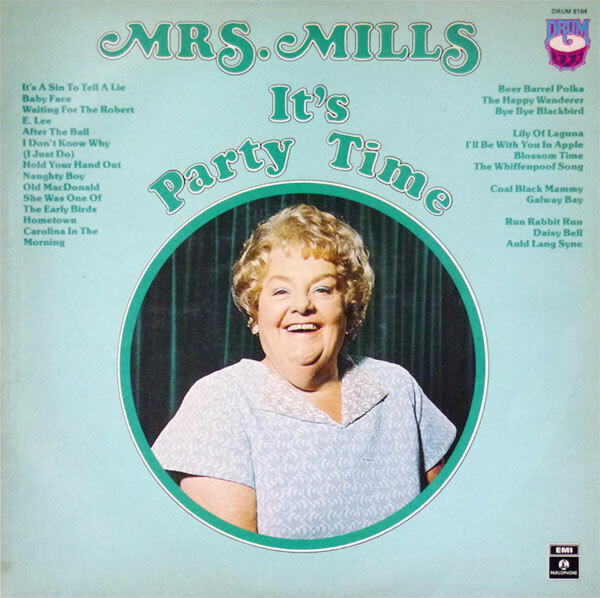 It's Mrs Mills' Party! In a recording studio! With crazy hats! (1964). Note the cigarette packet and lighter on the piano. 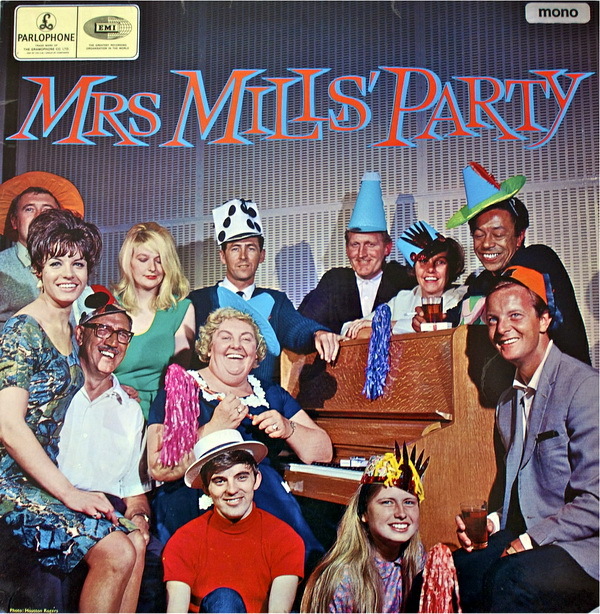 There's more mighty fine party hats and some amusing balloon shapes on display on the sleeve of 'It's Party Time' from 1965. The cover of 'Especially For You' (April 1966) is a comparatively solemn affair. 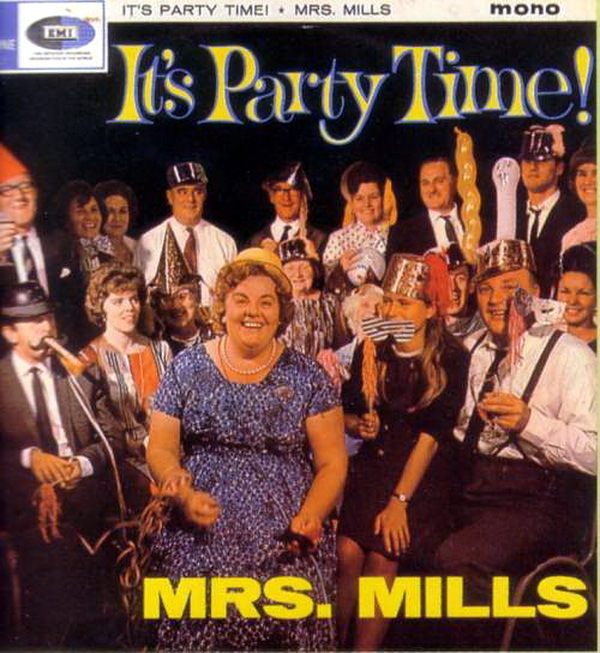 Another album with the name, 'It's Party Time'. 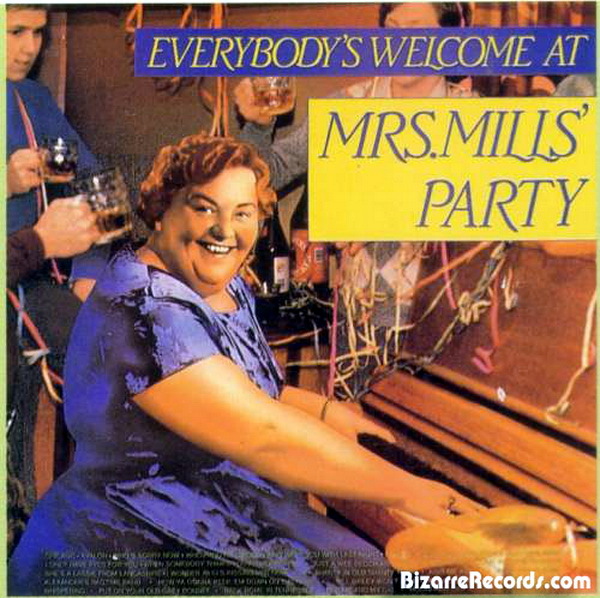 It's that same picture again for another version of the 'Everyone's Welcome At Mrs Mills Party' album, this time with a crazy typeface. 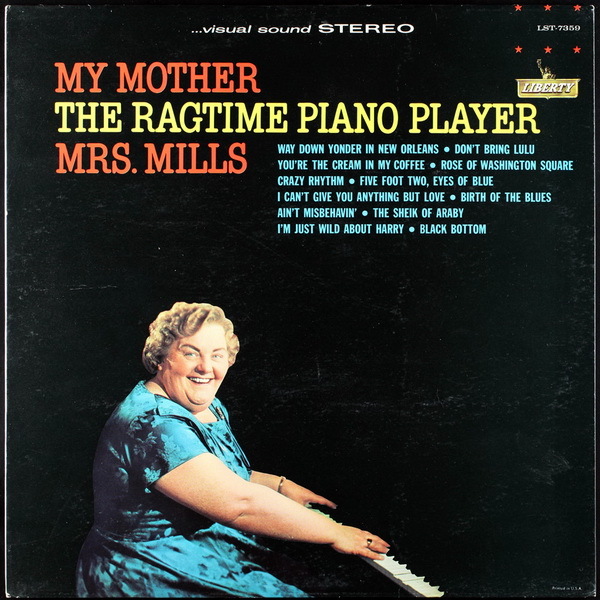 There's a curiously similar photo for the cover of 'My Mother The Ragtime Piano Player,' a US release of 'Mrs Mills Plays the Roaring Twenties'. 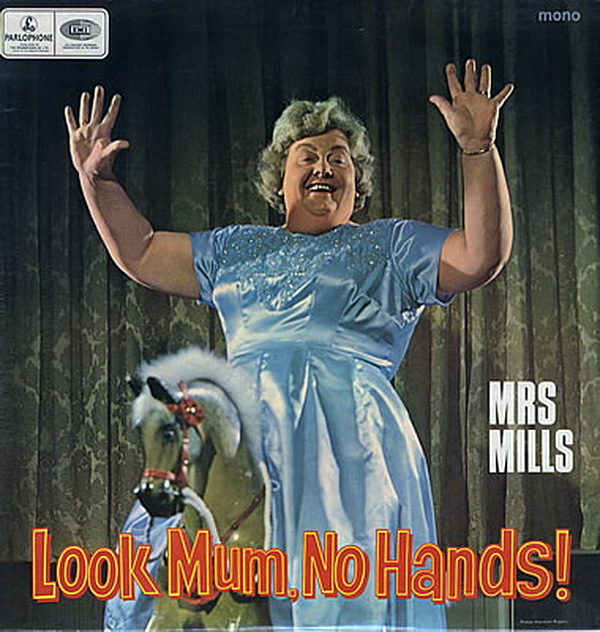 Perhaps one of her more bonkers covers is the fabuously crazed one for 'Look Mum - No Hands!' 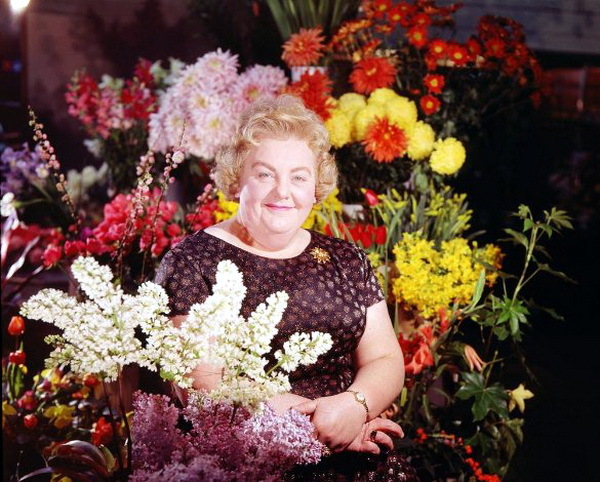 from April 1967, where she manages to look almost exactly like the equally wonderful Margaret Rutherford. 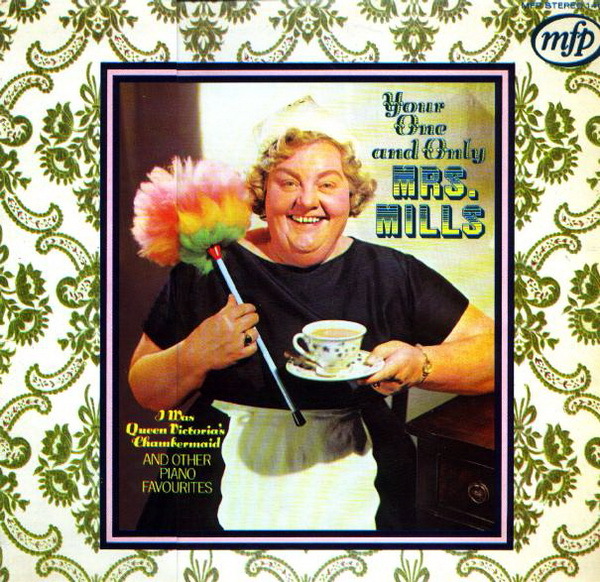 The dressing up box came out again for the cover of 'Your One and Only Mrs Mills' from 1967. 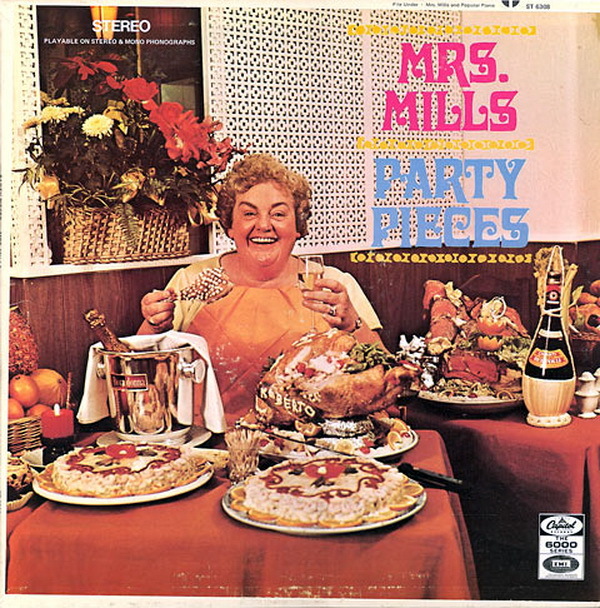 Gladys settles down for an exceptionally large feast on the cover of Party Pieces from November 1968. 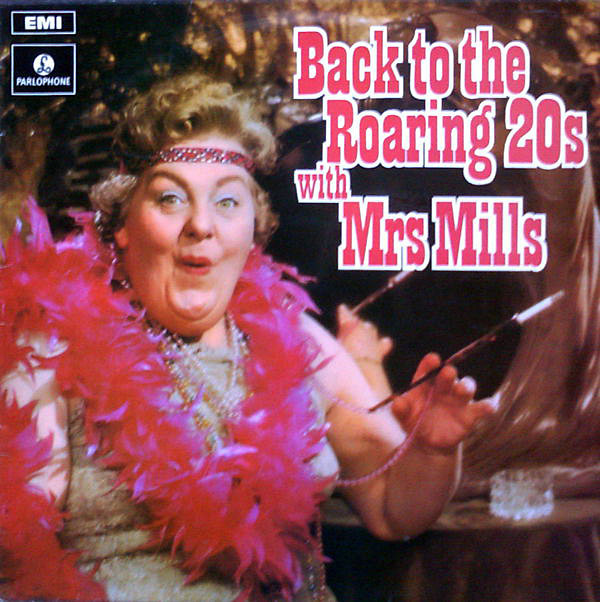 Gladys sure looks ready to party on the cover of 'Back To The Roaring Twenties' from July 1969. 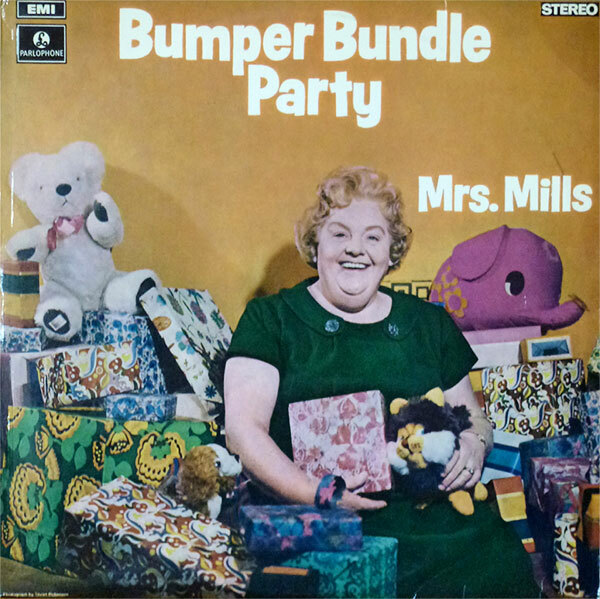 A teddy bear and a pink elephant can be seen on the cover of 'Bumper Bundle Party' from November 1970. 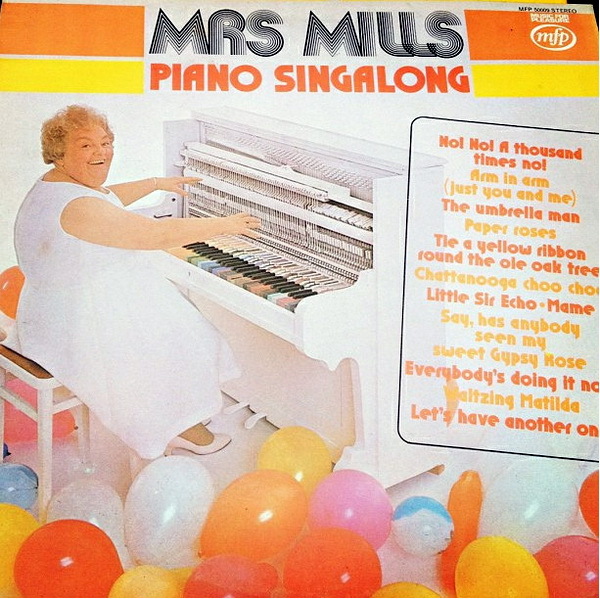 Shades of psychedelia in Mrs Mills' 1970 album, 'Party Singalong'. The cover is strongly reminiscent of Pink Floyd's 'The Piper at the Gates of Dawn' album from three years earlier. More fine party hats in attendance for 'All Time Party Dances' from 1971. 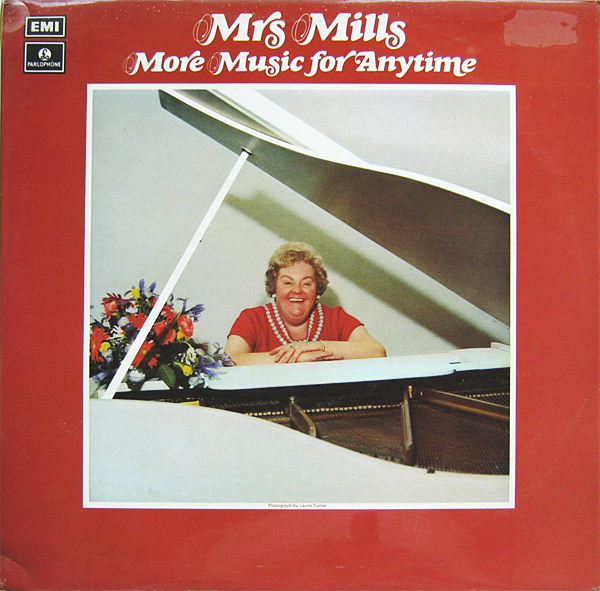 Mrs Mills poses behind a rather smart white grand piano for the 'More Music For Anytime' album from July 1971. 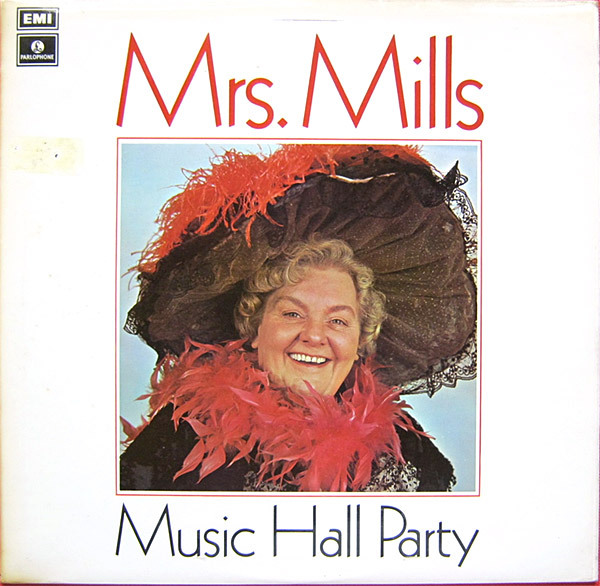 Mrs Mills Music Hall Party from January 1972. 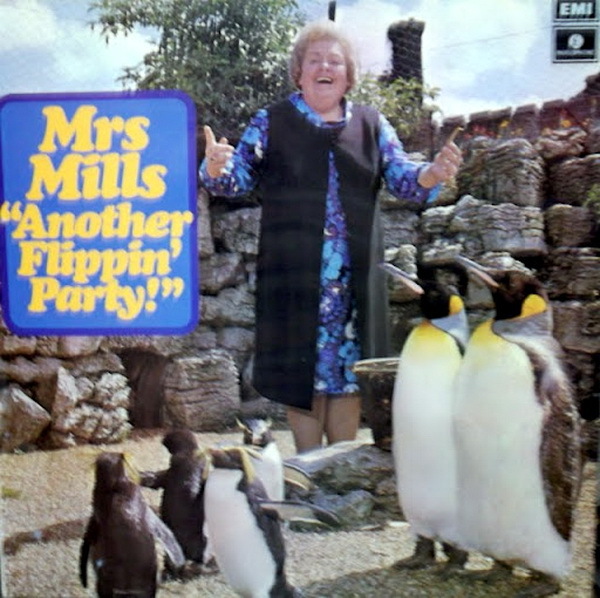 The October 1972 release of 'Another Flippin' Party' saw Gladys standing around with a bunch of penguins. And why not. 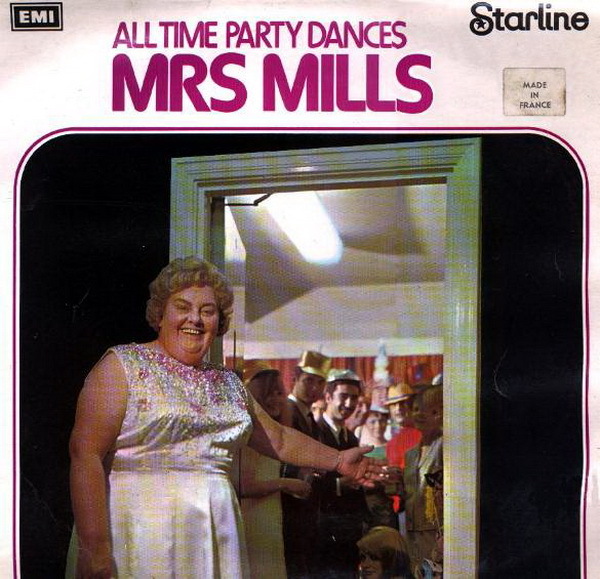 A particularly fine set of photos of Mrs Mills graces the cover of 'Anytime Is Party Time' from July 1972. 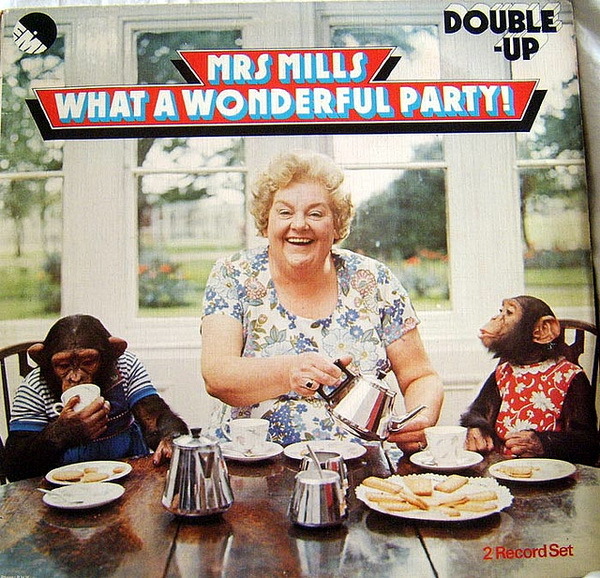 Mrs Mills enjoying a tea party with two chimpanzees! We've no idea either, but she seems to be enjoying herself. The album was released in 1973. 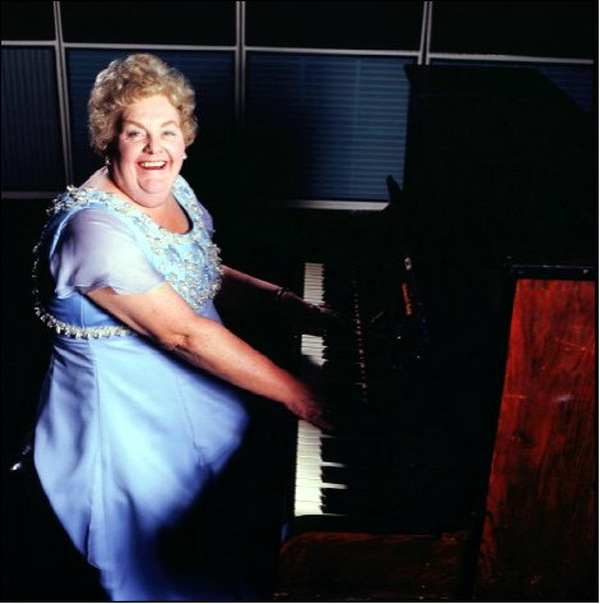 Here's the rubbish-looking cover of the Australian release of 'Piano Singalong'. Gor Blimey guv'nor! 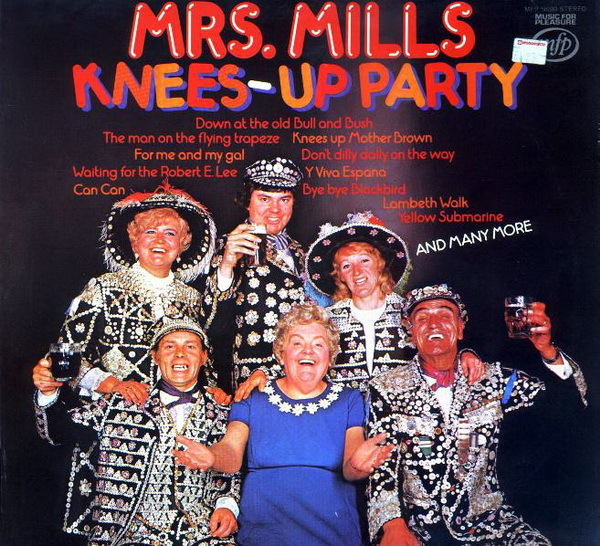 Beer-clutching Pearly Kings and Queens pose with Gladys for the cover of 'Mrs Mills Knees-Up Party' from 1975. 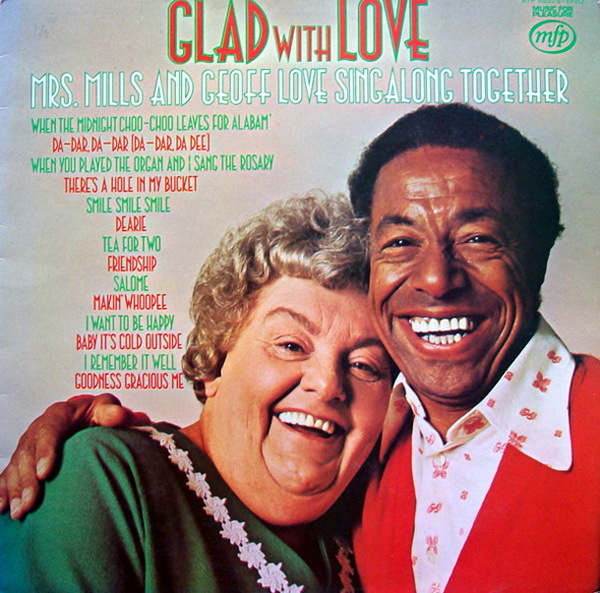 'Glad With Love' from 1975 with producer Geoff Love. Isn't a lovely cover? 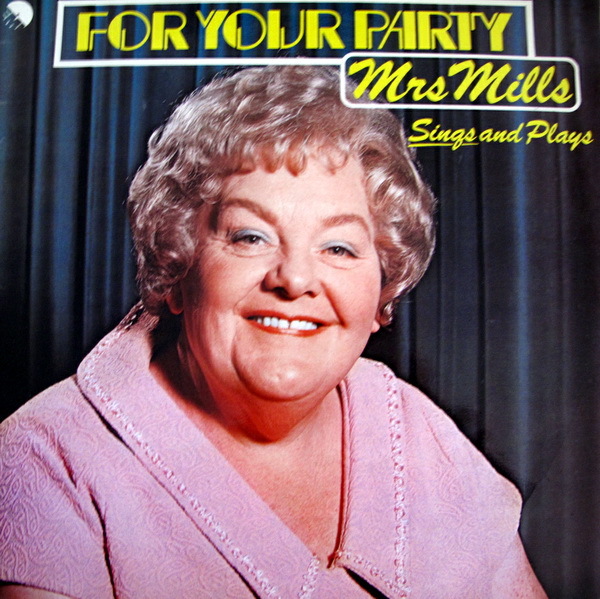 After the penguins, the sleeve of 'For Your Party' (from 1975) feels a little disappointing. 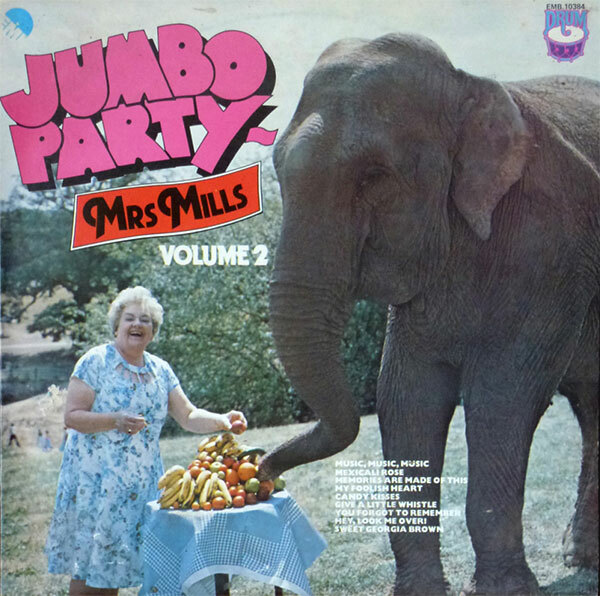 Gladys was back on form for 1976's Jumbo Party album. What a sleeve! 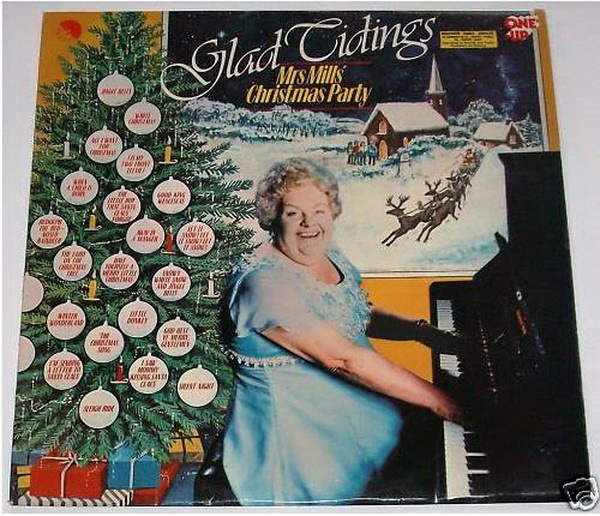 Here's the Christmas album, the painfully punned, 'Glad Tidings' from 1977, when punk was tearing up the album charts. 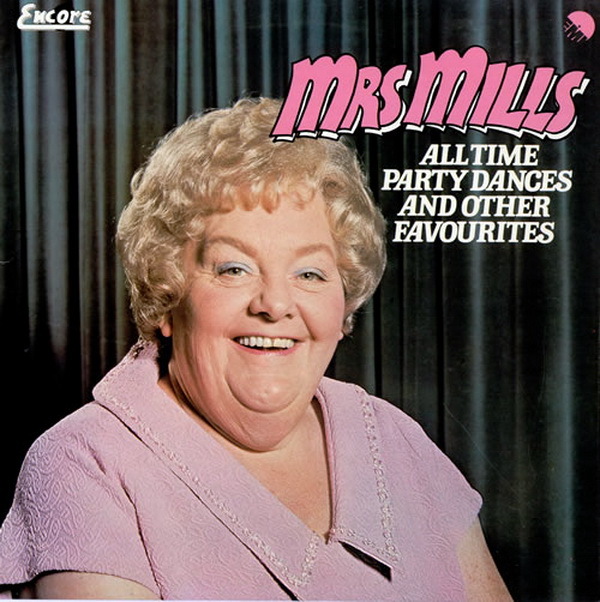 'All Time Party Dances and Other Favourites' from 1977. 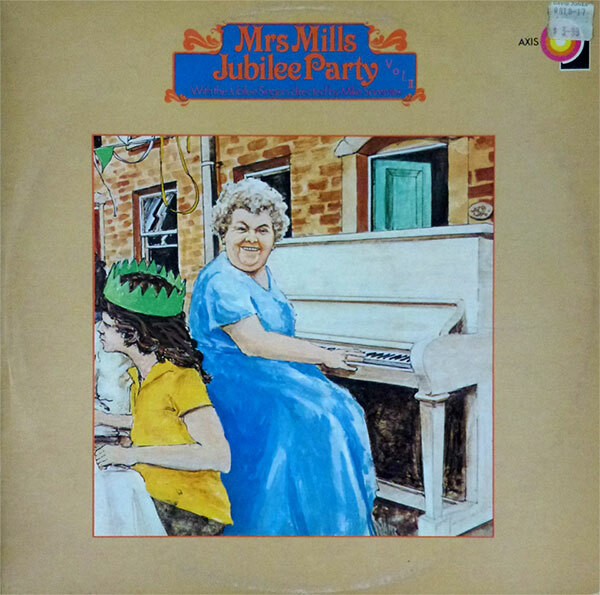 Released in 1977 to coincide with the Queen's Silver Jubilee, Mrs Mills Jubilee Party Vol 1 contains a track relesed every year for the 1952-1977 period. 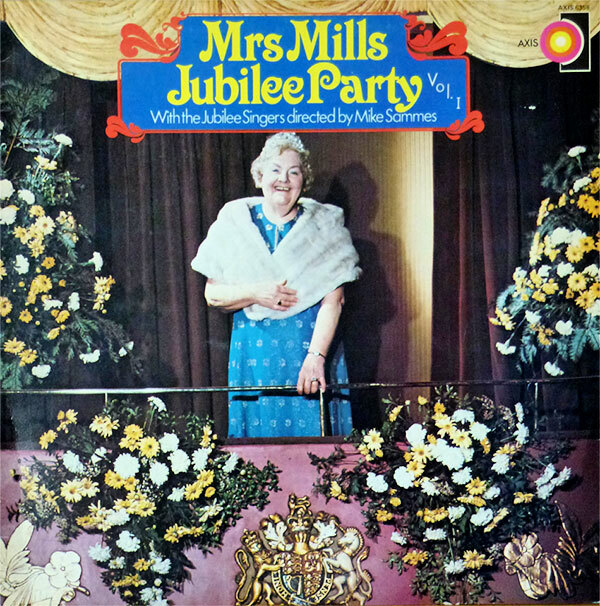 Mrs Mills Jubilee Party Vol 2, also released in 1977 has quite the worst Mrs Mills sleeve I've ever seen. What has the artist done to poor old Gladys?! 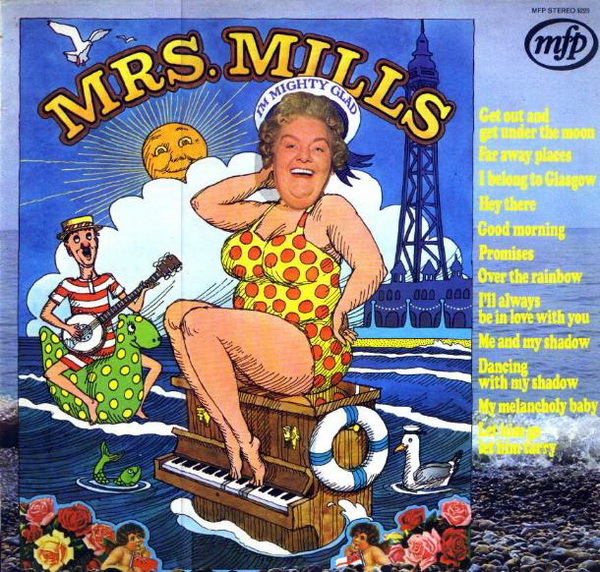 Mrs Mills in the studio. We'll be posting up more album and single covers shortly. If you've any you'd like to contribute, please drop us a line. 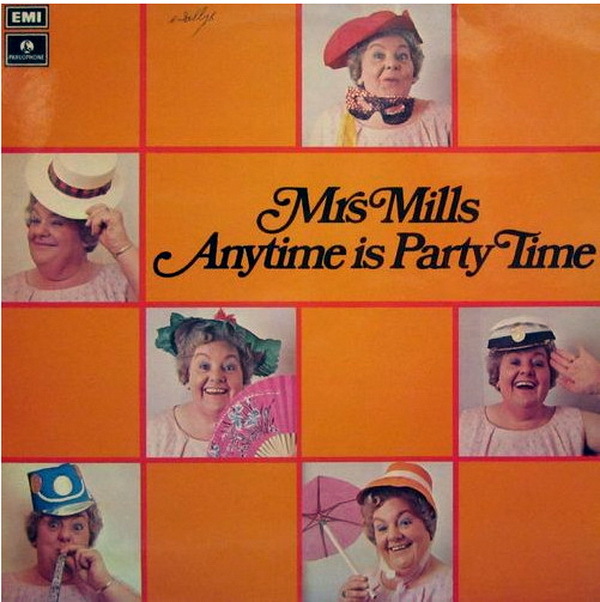 The Mrs Mills Experience tries to recreate something of the party atmosphere of the late, great Mrs Mills shows - if you like the sound of us, please like us on Facebook and look out for our forthcoming shows!